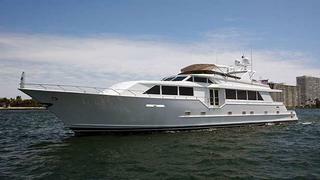 The 32.61 metre motor yacht Double Down has been listed for sale by Frank De Varona at Yachting Experts in Florida. Built in GRP by US yard Broward, Double Down was delivered in 1998 with major refits in 2009 and 2013. Accommodation is for eight guests in four cabins. The full beam master suite is located just forward of amidships along the centerline of the yacht to ensure maximum comfort and stability. Two guest cabins are located off the main accommodation passageway and have large cedar-lined closets with ample storage space. Forward of the galley is the VIP suite accommodating two guests with a desk and island double bed. All cabins have full en suite facilities. The main saloon has a granite-topped bar and entertainment centre immediately to port while across to starboard is a U-shaped sofa and a glass-topped coffee table. Forward in the saloon is a dining table for eight guests. There are built-in buffet cabinets of maple with cherry and ebony inlays for trays, glasses, dishes and silverware storage. In 2009 a KVH satellite television system was installed with receivers in the galley, saloon & all cabins including the crew quarters. Twin 1,350hp Caterpillar engines give her a cruising speed of 18 knots and a maximum speed of 23 knots. Lying in Fort Lauderdale, Florida, Double Down is asking $3,195,000.